I have had this huge bag of lentils in my pantry that I have been meaning to use. That is where this Green Lentils and Mushrooms dish came about. Lentils are so versatile. My most favorite lentil dish is my Lentil Sloppy Joes. A must try if you haven’t already! 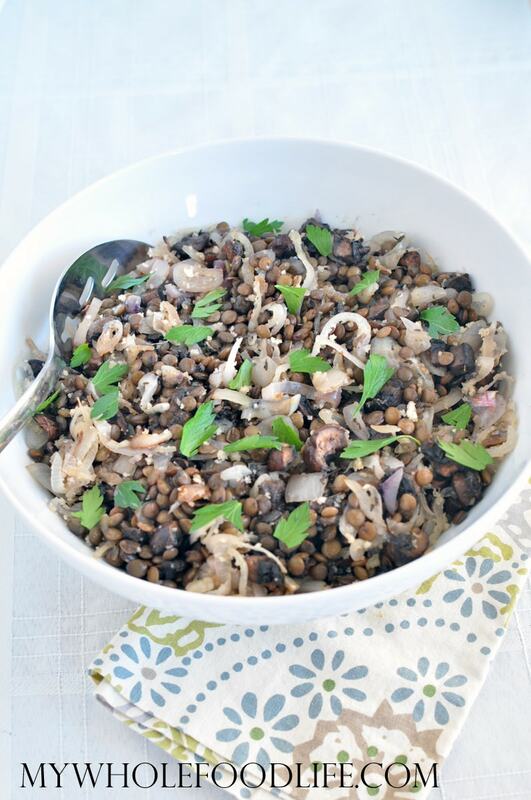 Green lentils have an earthy flavor that goes so well with the mushrooms. I added crispy shallots to add a sweetness to balance out the earthy flavors. It went very well! I also think spinach or kale could be a yummy addition to this. This dish is vegan and gluten free. It’s also very budget friendly. In a large saucepan , mix the water, mushroom, lentils, thyme and sage. Mostly cover on low heat for about 30 minutes stirring occasionally. The water should cook off. Remove from heat. In a small saucepan , add the shallots oil. Cover for about 10 minutes or so and let brown. Stir often. Remove the cover. Add breadcrumbs to the onions and stir for another 2-3 minutes. Remove from heat and add to the large pan. Serve over a bed of rice or quinoa. I thought this was delicious! I'm a mushroom lover so it worked for me. Thank you! Thanks Jennifer! So glad you liked it! Now I know what to do with the bag of dried lentils in my 'pantry' (the top shelf of my wardrobe :P ) I've really wanted to use them but I've had conflicting information about wether or not you need to soak them. So... do you need to soak the green lentils? It doesn't say so in the recipe but is it assumed...? I like to carmelize onions in small amount of coconut oil and add after lentils have cooked ~ I thing this adds dimension of flavor Love, love, love all of your and Marcus's recipes! That sounds like a fabulous idea!